The United Nations University's Project on Transnationalization or Nation-Building in Africa (1982-1986) was undertaken by a network of African scholars under the co-ordination of Samir Amin. The purpose of the Project was to study the possibilities of and constraints on national autocentric development of African countries in the context of the world-system into which they have been integrated. Since the 1970s the world-system has been in a crisis of a severity and complexity unprecedented since the end of the Second World War; the Project examines the impact of this contemporary crisis on the political, economic and cultural situation of Africa today. Focusing on the complex relationship between transnationalization (namely, the dynamics of the world-system) and nation-building, which is seen as a precondition for national development, the Project explores a wide range of problems besetting Africa today and outlines possible alternatives to the prevailing development models which have proved to be inadequate. 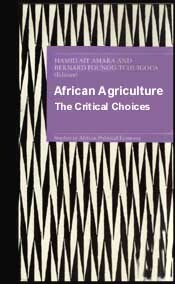 African Agriculture: The Critical Choices was first published in 1990 by: Zed Books Ltd., 57 Caledonian Road. London N1 9BU, UK, and 171 First Avenue, Atlantic Highlands, New Jersey 07716, USA and: United Nations University Press. Toho Seimei Building, 15-1 Shibuya 2-chome, Shibuya-ku, Tokyo 150, Japan in co-operation with The Third World Forum. B.P. 3501, Dakar, Senegal. Copyright � The United Nations University, 1990. Translation by A. M. Berrett. Cover designed by Andrew Corbett. Typeset by EMS Photosetters, Rochford, Essex. Printed and bound in the United Kingdom at Bookcraft (Bath) Ltd. Midsomer Norton. African agriculture: the critical choices. 1. Africa, Agricultural industries. Social aspects. I. Amara, Hamid A�t. II. Founou-Tchuigoua Bernard. III. Series. 1. Agriculture and state - Africa - Case studies. 2. Food supply - Government policy - Africa - Case studies. 3. Produce trade - Government policy - Africa - Case studies. I. Amara, Hamid A�t. II. Founou-Tchuigoua, Bernard. III. Series. The agricultural revolution, but how?